"Before we begin, I must warn you... nothing here is vegetarian." From Titan Merchandise comes the Hannibal Ttitans The Aperitif Collection! This Hannibal TV The Aperitif Collection Mini-Figure Display Case contains a total of 20 blind-boxed figures. Ages 15 and up. 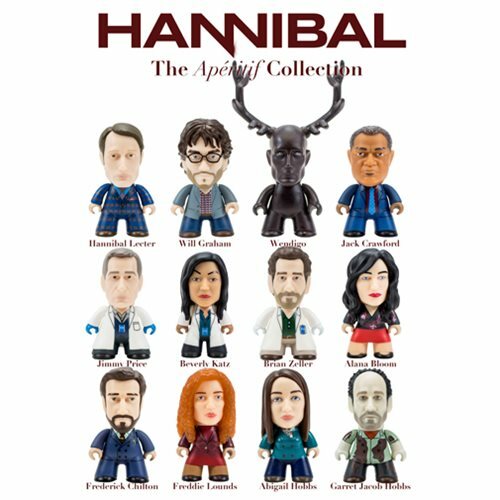 The Hannibal TV Aperitif Collection features characters standing at 3-inches tall. Characters in the Aperitif Collection range from the brilliant psychiatrist (with a secret) Dr. Hannibal Lecter, as portrayed by Mads Mikkelsen, as well as troubled FBI Profiler Will Graham and the terrifying Wendigo! Head of the Behavioral Science Unit Jack Crawford, everyone's favourite Forensic Scientist Trio, Team Sassy Science, and many more characters from the first season of Hannibal!